This adorable soccer-theme set will make a great gift for your newest little sports star. Make it in pink and white for a girl! 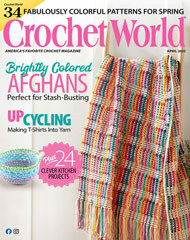 This e-pattern was originally published in the Spring 2014 issue of Crochet! magazine. Size: Hat: Fits Newborn through 13" circumference. Blanket: 25 1/2" from side to side; 28 1/2" from corner to corner. Made with light (light worsted) weight yarn and size F/5/3.75mm hook.